Can easily be found with a little work. The two outdoor air conditioners that you see on this page obviously need to be replaced and those air conditioners probably should have been replaced a long time ago. The fins around the coils were eaten away by the salts and liquid from dogs urinating on them. 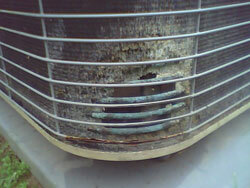 The reason they corroded is because the Freon coils are made of copper and the cooling fins are made of aluminum. When two dissimilar metals are combined and as a liquid crosses both of them a tiny electrical current is generated. That current causes the weaker of the two metals to corrode faster than the other metal. The aluminum fins are not as strong as the copper coils, so they give out first. The copper follows and typically an air conditioning system like this experience a total failure. 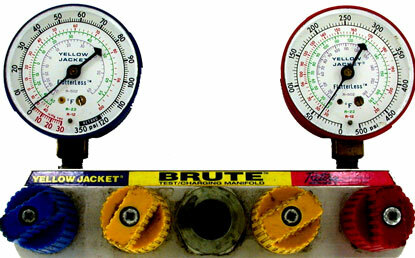 Most leaks require a length of time before destroying the compressor. 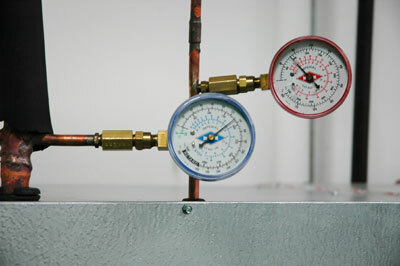 Freon cools the compressor in the outdoor air conditioner and it also carriers the cylinder and scroll lubricating oil. 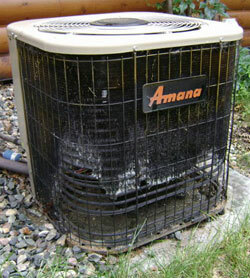 If you run your air conditioner to low on the Freon it is like running your car engine without oil or water. These two pictures I took in our classroom. We have several systems set up for training purposes. Under normal conditions you cannot see any Freon leaking. This is demonstrated in the picture where the lights are on. 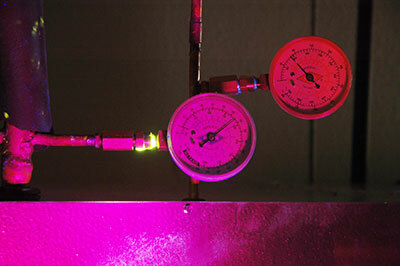 I treated this system with a leak re actant that fluoresces when combined with oxygen. As the Freon leaks out it leaves behind a slight amount of the fluorescent dye. You can see that dye as the bright yellow glow in the darker picture. I merely flooded the area with ultra violet light. Fixing large Freon leaks usually involves tightening a connection, replacing a section of line that has hole in it (usually a picture hanging nail hole or a roofing nail) or fixing one of the service ports. Seldom does sit involve anything very serious. Click on one of the coupons in the upper right hand corner ofthis page and give us a call. 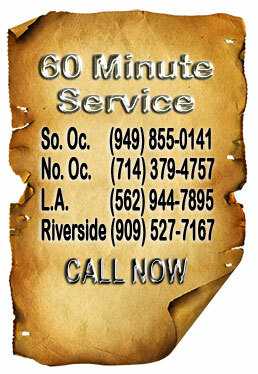 We are here to help you with all your Freon leaks. ..He explained everything in great detail and he made the experience very comfortable and clearly understandable. I am very satisfied with their service and their work is to be highly commended. …most important I’m very pleased with your honesty and your professionalism.